Soon after his election as president of Iran, on June 25, 2005, pictures of Mahmoud Ahmadinejad emerged showing him as a hostage-taker. 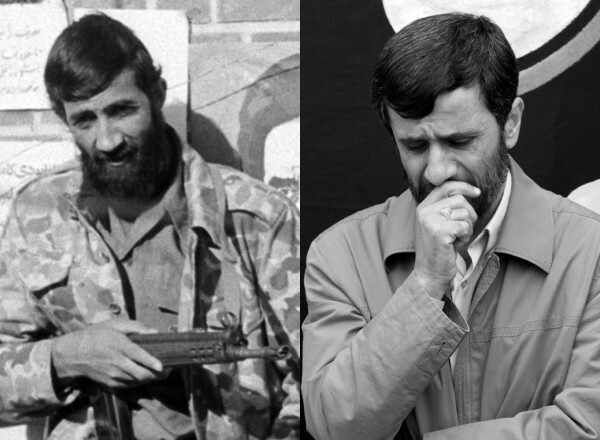 An Associated Press photograph showed a man looking very much like a younger version of today's Ahmadinejad holding a blind-folded man, apparently five days after the U.S. embassy in Tehran was seized on November 4, 1979. 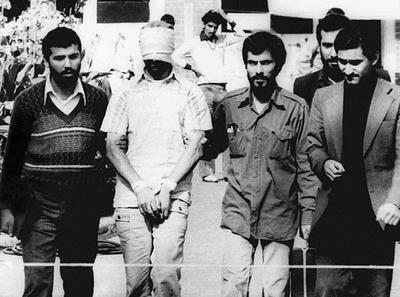 The AP photo of Iranian hostage-takers with American hostages. Five former American hostages confirmed that Ahmadinejad as one of their captors. William J. Daugherty, a former intelligence officer, said he saw Ahmadinejad 8 to 10 times at the start of his captivity: "I recognized him right off. … I remember so much his hatred of Americans. It just emanated from every pore of his body." BBC correspondent John Simpson recalled seeing Ahmadinejad on the embassy grounds. Abholhassan Bani-Sadr, a former president of Iran long living in exile, asserted that Ahmadinejad "wasn't among the decision-makers but he was among those inside the Embassy." But Ahmadinejad's office denied these allegations and other hostage-takers, some of them now political opponents of Ahmadinejad – including Mohsen Mirdamadi, Hamid Reza, Abbas Abdi, Mohammad-Reza Khatami, and Saeed Hajjarian Jalaiepour – confirmed his account. One former American hostage denied Ahmadinejad had been a captor. Amir Taheri, editor-in-chief of a Tehran newspaper in the shah's time, concluded that "it is almost certain Ahmadinejad was not directly involved in the US embassy episode." Thus did the issue die inconclusively: Ahmadinejad was for sure a central committee member of the main student group behind the embassy takeover, the "Office for Consolidating Unity between Universities and Theological Seminaries," leaving his precise role in the hostage-taking murky. A new picture located by Kommersant re-opens this issue, providing new evidence that Ahmadinejad was not some backroom political type but in fact was a automatic gun-wielding hostage-taker. The person pictured here differs from the one in the Associated Press photograph, but should Ahmadinejad's identity as hostage-taker be established and accepted, it has two implications at this particularly delicate moment in U.S.-Iranian relations. Is that Ahmadinejad in Kommersant's newly-located picture on the left? A recent photograph is on the right. First, it brings back, especially for Americans over forty years old, the powerful and enduring humiliation of the 1979-1981 embassy takeover, with the likely consequence of hardening U.S. attitudes toward an Ahmadinejad-led government building nuclear weapons. The present alarm over his intentions will be fueled by a renewed mistrust. Second, although Ahmadinejad is a powerful and dynamic politician, he has many domestic opponents and this evidence provides them with new evidence of his extremism, rashness, and unsuitability to govern the country, which they may be able to exploit. Given the tepid reception to the picture that surfaced in June 2005, however, I expect that the information in this photograph will also be finessed. The machinery of international politics will likely find it too inconvenient for this unsavory history to be assimilated. Nov. 13, 2006 update: For new information on this and relatead topics, see my weblog entry, "Mahmoud Ahmadinejad's Dubious Past."